It’s been a very long time since Oregon was severely beaten, but that’s what happened Saturday night. There’s no sugarcoating it. Washington pounded the Ducks in every possible way in a 70-21 win in front of over 58,000 inside Autzen Stadium.. Oregon’s 12-game win streak over the Huskies ended with an unceremonious thud. Washington improves to 6-0 on the season, while the Ducks fell to 2-4 with a lot of questions that need to be answered as they go into a much-needed bye week. One could tell it was going to be a long night for Oregon when it fumbled the kickoff, but recovered, only to follow with an interception and Washington scoring three plays later for the 7-0 lead. The Huskies were up 14-0 in just half a quarter and it could be said at that point the game was over. Oregon’s defense never found an answer for quarterback Jake Browning, receiver John Ross, or tailback Myles Gaskin. The sophomore signal caller was 22-of-28 for 304 yards and six touchdowns with two more scores on the ground. Browning accounted for more touchdowns (8) than he had incompletions (6). Ross managed nine catches for 94 yards and three scores. Gaskin rushed for 197 yards and a touchdown. He wasn’t even the Huskies’ leading receiver. Dante Pettis also had a huge game with his eight catches for 134 yards and two touchdowns. As a team, Washington rushed for 378 yards and had 682 total yards. The 70 points were the most points scored by a Husky team over an Oregon team. While the Huskies were torching the ducks through the air, Gaskin broke off several huge runs as he gashed the Oregon defense all night long, a night Washington fans have been waiting for over a decade. 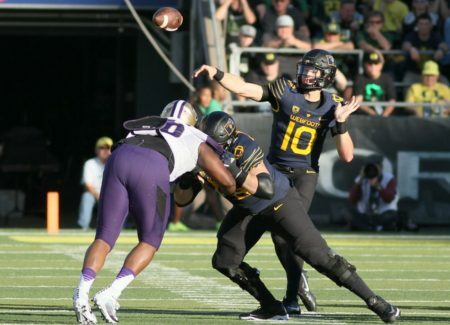 It was eventually 28-0 before the Duck offense found the end zone behind true freshman Justin Herbert. The Sheldon graduate would have his ups and downs as one would expect. Herbert found Tony Brooks-James over the middle for an 18-yard strike after scrambling and throwing off his back foot. But that one touchdown wasn’t nearly enough to keep momentum on the Oregon sideline. Washington was able to score right before halftime on Jake Browning’s seven-yard rush to make it 35-7. The slaughter didn’t end at the break, however. Washington scored on its first possession of the third quarter on the third touchdown pass to Ross to make it 42-7. The Duck offense was able to put together an eight-play, 66-yard drive that ended with Herbert finding Taj Griffin on a 21-yard swing pass and run for the touchdown to briefly cut the deficit to 42-14. In Herbert’s first start, the Eugene native was 21-of-34 for 179 yards and two touchdowns. Against a tough defense, Oregon’s offense never found any consistency. The Ducks had 409 total yards. Washington never let up as it took them just over a minute to get that score back. Lavon Coleman’s 42-yard run set up Dante Pettis’ 28-yard touchdown reception and it was 49-14. At that point the final score almost didn’t matter. The Ducks will now try to pick up the pieces and figure out what went wrong and make sure another similar performance doesn’t happen in two weeks at Cal. Oregon has a bye week coming up and the Ducks will need the next 13 days to recover and somehow salvage this season. The post Huskies Crush Ducks 70-21 appeared first on DuckNews.com.